QUEEN'S ROAD: A startup is looking beyond nursing to address the problems of elders comprehensively. 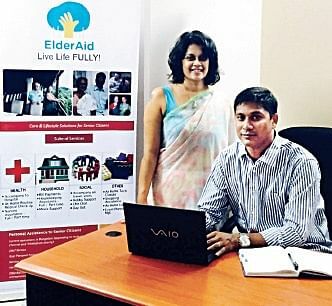 ElderAid aims to help the elderly live a full life with grace and dignity. Its services cover three areas: health, household chores, and social life. Services include accompanying clients to hospital appointments, helping with bill payments, teaching them tech, accompanying them on trips out of town, providing meals, and going shopping with them. Founders Santosh Abraham and Vandana Nadig Nair, both entrepreneurs who have successfully launched other ventures, thought of starting something for older people when Vandana’s uncle passed away, and she had to attend the funeral. “There were so many elderly people there, and most of them were complaining how difficult it had been for them to travel to the funeral,” says Santosh. When they did a quick market study using their extended families and friends’ circle, they realised that many start-ups helping the elderly were focused only on nursing and hospital services. “But there’s more to their life than just hospital appointments and medical emergencies. We decided there was a need for a startup that looked at old age holistically,” said Santosh, who has been a sales and marketing professional for more than 15 years. The team started out by making presentations at apartment complexes around the city. Some of them already had in-house teams caring for the elderly, but the response was eager and positive. “A lot of people just needed help going out. And we’re almost like a glorified concierge service,” said Santosh, laughing. Dr Renuka, based in the US and one of the core team, is campaigning there, reaching out to people who have elderly parents back in Bengaluru. “While the parents think that spending on themselves is unnecessary, the children want to assure themselves that their parents are comfortable while they are away,” Santosh said. Santosh’s parents live in Kerala, and do not want to move to Bengaluru to stay with him, as they fear being alienated in a new city. “This is another common problem. Senior citizens rarely want to uproot themselves from their communities, even if it means they must stay away from their children. Our next step, of course, is to start services in Kerala and other South Indian cities,” said Santosh. The start-up began operations only two weeks ago, and already has 10 families on its rolls, mostly in Malleswaram and Basavanagudi. The five-member core team, which includes a psychologist and doctor, is looking to rope in MSW students as volunteers. “By the end of the year, we want to serve at least a hundred families, after which we can look at pitching for funding and expanding,” Santosh said. ElderAid offers three packages: Gold (Rs9,500 a month), Platinum (Rs15,000 a month), and Custom (Rs3,000 for six months and Rs5,000 a year). Gold gets you two monthly visits from an executive, alternate day telephone checks, medical emergency response, and two accompanied shopping visits. Platinum brings similar services but with daily telephonic checks, and two days out of town. Custom is for those who need minimal assistance. The packages are not inflexible. "If a client falls ill, someone from our team stays with him for up to 48 hours, till a family member can come and take over," Santosh said.